Welcome to Blue Heron Aikido! We look forward to instructing your child in this fun, challenging, martial art. Aikido is a Japanese martial art that was founded by Morihei Ueshiba Sensei. Aikido is different from many other martial arts in that it seeks nonviolent resolution to conflict situations. We aim to diffuse tension and conflict in a way that sustains life, rather than destroying it. Training Uniform: Before your child shows up to class, please make sure that he or she has a gi or dogi, which is our training uniform, and a white belt. Proper uniforms are required. You can find dogi online at Karate Depot, Amazon, and Judo Gis. You can ask Greg or Jeffrey about uniforms. Location: We are in the gymnasium of the Bridge School on Exchange Street, Middlebury, VT.
Class schedule: Check our schedule for updated times, and look for “Kids Class”. Scheduled start is bow-in time, meaning students need to get to class early in order to change (if they do not show up dressed in their gis, which is acceptable), and also to help with misogi. Misogi refers to the cleaning of the dojo, and is an integral part of a student’s training. Training fees: $15 a class, or $50 for unlimited training in a given month. Cash is accepted, although checks, made out to “Blue Heron Aikido” are preferred. Attendance: while we encourage students to train twice a week as often as your schedules allow, we realize that this might not be possible. Training once a week is acceptable. If your child will miss training for a long period of time, please let us know. Promotions: rank promotions will be given after public demonstrations (not the same as testing! ), and cost $20. The dojo will provide colored belts as students advance. Hygiene: please make sure that your child’s gi is clean for training. Please ensure that fingernails and toenails are trimmed – long nails can be weapons! Hands and feet should be clean for training – we train barefoot, and will be grabbing our partners, so cleanliness is an important health consideration. 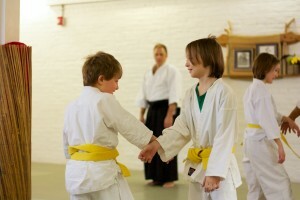 Etiquette: students are expected to follow standard rules that would be found in a traditional Japanese dojo. This includes bowing when they enter and exit the dojo, when they step on and off the mat, and when they ask a partner to train with them. There is no foul language, no horse play or rough housing, and students are expected to sit still and quietly when an instructor is speaking. As noted above, misogi, or cleaning, is also part of training. Your child will learn other standards of etiquette as they immerse themselves in the training.